Some website owners have a burr under their collective saddles about ad blockers, and we frequently encounter a site that will say, in essence, "Shut off your ad blocker or we won't let you view our site". (If I wanted to get bullied, I'd talk about the truth of biblical creation science to atheists.) So, I click out of the site — which may have received traffic if I used them as a reference in an article. There are some sites that ask you nicely to shut off the ad blocker, but let you continue. An attitude like that may cause me to reconsider if I have to go back there again. Some cranky authors attempt to make a case that we are "stealing" if we use an ad blocker. Are we stealing when we fast-forward through commercials on our DVRs? Wonder where their foundation is for morality and ethics. Anyway, such a complaint doesn't make a whole heap of sense if you study on it. Not everyone is blessed with ultra-high speed connections that gallop to the far horizon in a flash. Advertising is intrusive and slows folks down, especially on mobile devices where the user is required to pay extra for internet access. What really takes the rag off the bush is when advertising videos pop up when I'm trying to read or research. I close out of those, too. One reason ad blockers exist is because of privacy and tracking concerns. There are services that combat tracking that are used in conjunction with ad blockers, but they often interfere with your browsing pleasure if they're not adjusted properly. Sometimes they interfere anyway. Some sites "monetize" (which I can do on my own sites). This can be done by popping up ads about vacations (can't afford Jamaica and don't have enough vacation time), cologne (got some that I haven't worn in years, don't need more), a new car (paying off the emergency loan on the current car), a new computer (maybe later), dating sites (my wife frowns on that), and so on. Besides, if I'm pressed for time or just want to read and more on, I ignore the ads that don't get blocked. I reckon that most people have trained themselves to have blind spots to them as well. Many sites run low-quality ads, and worse, allow sidewinders to post adware, malware (such as "you have been infected, call...") and links to Potentially Unwanted Programs. Then you have to learn how to remove the infections and PUPs. I suspicion that ad blockers help reduce those threats. Practice safe computing so you don't get infected with something nasty. Let's study on this claim that using an ad blocker is "stealing" a bit more. When we visit sites, we are not committing to purchase a doggone thing. Going into the Big Box Chain Store to look around, or maybe have something specific in mind that we can't find, we're not stealing. (The comparison is flawed, I know, but I think the point is valid.) Also, there are many sites that are free, so we don't cotton to getting bushwhacked by those who say they depend on ad revenue for purchase that are unlikely to happen in the first place. They get paid for letting people post the ads? Not my problem. After all, aren't we trained by cyber experts to be skeptical of monetary scams? So, to the guy who says that those of us who use ad blockers are "stealing", I have some bad news for you, sunshine: nobody's stealing. Maybe if you made your site a pay-for-subscription thing, people would be happy to make you rich to see your exquisite and informative content. By the way, something else I've seen is that site content is freely available for a while, but later it's only available to subscribers. That may be a good idea, since the free material can be advertising in a way for the rest of the content. 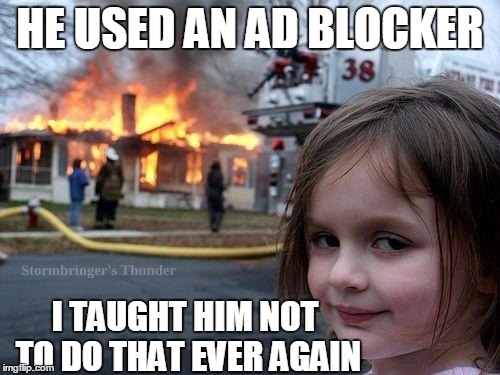 Here's an article that deals with the above subject matter in less of a rantish and sarcastic manner: "Is using ad-blocking software morally wrong? The debate continues".